Once upon a time I lived in a house that was covered in poison ivy. I worked in a public garden at the time, so I became an expert at avoiding poison ivy, and how to treat it with at home remedies. Until recently I never thought about what was actually happening when the dreaded poison ivy touched my oh-so-delicate skin. I terribly frightened of a plant that comes in so many forms: a shrub, a vine or a determined plant that carpets the side of the road where I ride my bike. Here is my personal attempt at fighting fear with knowledge. First lets start with the plant itself. Poison ivy is part of the family Anacardiacea, which is known for oily substance called urushiol. This mix of compounds is part of the plants sap and causes allergic skin irritation. Urushiol is in all parts of the plant. Most harmful to humans is the chemical stored between plant cells, right under the leaf surface. (See the oh-so-accurate drawing to the left.) Very little damage to the leaf is needed to release the chemical onto the leaf surface. From living in the poison ivy house I learned that the urushiol can drip onto roofing tiles, and then on the deck chairs and still give you a rash. It’s powerful stuff! When you touch a poison ivy leaf what happens? When the urushiol hits your skin it chemically reacts with membrane proteins on exposed skin cells and changes shape. 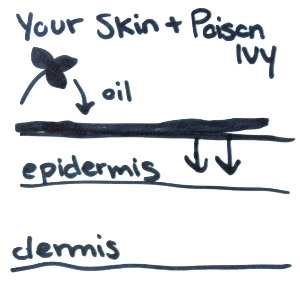 To cause problems these complex molecules have to penetrate through the epidermis layers of your skin. This is why washing with soap and cold water immediately post contact is recommended. You can just wash the problem away! Once urushiol-based molecules hit the dermis skin layer your immune system kicks in. It cannot identify the modified proteins and a T-celled mediated immune response is initiated, which causes the gross, itchy rash associated with poison ivy. The technical term for poison ivy rash is: allergic contact dermatitis, or even more specific urushiol-induced contact dermatitis. Broken down this means: an altered or unwanted immune response resulting in inflammation of the skin. Sounds about right. The toxic effects of an encounter with poison ivy are indirect. My immune system's inability to recognize certain cells causes an attack on these cells as if they were foreign bodies. Urushiol, the combination of skin-irritating chemicals, is in all parts of the poison ivy plant. Even though I know more about poison ivy, I'm not going anywhere near it without ample protection, or maybe some goats. Why are there no baby boys?